Children 10 and younger with spina bifida and their families are invited to the rescheduled date for this fun annual event. 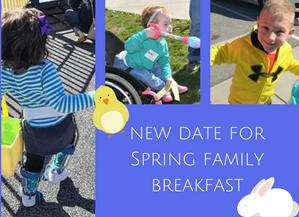 We will make spring-themed crafts, play games, and enjoy a delicious and healthy, kid-friendly breakfast. Parents,we will also provide coffee and tea because we know this is early for a Saturday. Come dressed appropriately, as we plan to spend some time outside on the accessible playground, weather permitting. Join us on April 21st from 9:30 am – 11:30 am at the LeBlond Recreation Center on Riverside Drive. If you registered for the canceled date, we hope you can still join us on April 21st. Please re-register so we know you are coming. Contact Diane at dburns@sbccincy.org with any questions or call 513-923-1378.